Note: These bits of trivia were from my own observations or findings. The word 'trivia' itself means 'useless facts' so at times I am using that term to the fullest here! I will do my best at not duplicating similar bits of information from other sites such as Internet Movie Database. Since there is so much trivia for this film, I will add other bits of information that come to mind or discovery. I would please ask that if you want to use any of these bits of trivia for your own web site that you give credit to where you originally found them. If you wish to add something or find an error in any of these entries, please e-mail me. Thank you! 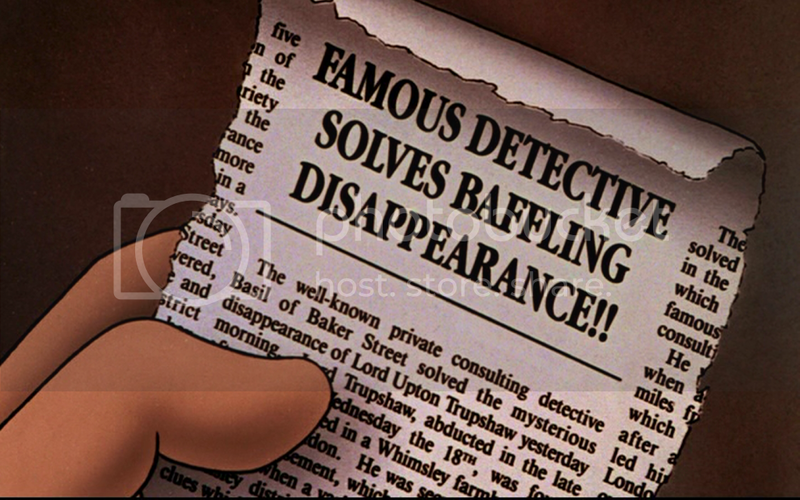 After a poor response from a test audience, the film was renamed from Basil of Baker Street to The Great Mouse Detective. This sparked an amusing memo in 1986 to go around the Disney studios. It told everyone that the film titles have all been changed for the past animated features. When talking to any Disney animator of today, they will refer to the film as Basil of Baker Street (or just "Basil") every time. The original Basil of Baker Street book is set in the year 1885, whereas the film takes place during the Queen's Diamond Jubilee in June, 1897. When Dawson finds Olivia in the boot crying, she shows him a newspaper clipping about Basil solving a case about an abducted mouse named Lord Upton Trupshaw. In the article, the abduction occurred Wednesday the 18th. By checking old calendars in the 19th century, the only Wednesday the 18th before June, 1897 happens in 1896 on November 18. Incidentally, Disney fans know this as Mickey Mouse's first film debut birth date. In Basil of Baker Street, Basil cannot play the violin, and when he does, Dawson cringes and exclaims it sounds like several cats screeching. Instead, he plays the flute. While Olivia says Basil's name repeatedly and respectively throughout the film, Basil never addresses her by her first name, nor does he pronounce her surname, Flaversham, correctly in her presence. He only addresses her as "My dear" or "Young lady." During the entire scene inside the toy shop, Olivia never utters a single word, staying true to Basil's earlier line, "And not a word out of you. Is that clear?" This bit of trivia is found at Internet Movie Database, but I was the one who originally submitted it! When Olivia starts the music box of the blaring firemen band, Dawson gets spooked and leaps into Basil's arms. This is clearly a reference to the Hanna-Barbera animated series, "Scooby-Doo" (1969) when a frightened Scooby would leap into Shaggy's arms. At least it seems like a reference since Scooby jumped into Shaggy's arms A LOT! Also, "Scooby-Doo" was a show about solving mysteries. As Olivia moves closer to the baby carriage (next to the bubble-blowing Dumbo toy), listen to the creaking sound effect of the rocking. The rocking chair effect is recycled sound from Dumbo (1941). It's used while a mother kangaroo rocks her baby during the song, "Baby Mine." As Basil is examining Fidget's list, he says the following: "Offhand, I can deduce very little. Only that the words are written with a broad pointed quill pen which has spattered, twice. That the paper is of native Mongolian manufacture, no water mark. And has been gummed, if I'm not very much in error by a bat who has been drinking Rodent's Delight!" This dialogue was borrowed (with alterations) from "The Adventures of Sherlock Holmes: The Man with the Twisted Lip." Quoted by Holmes, it goes: "Written in pencil upon the fly-leaf of a book, octavo size, no water-mark. Hum! Posted today in Gravesend by a man with a dirty thumb. Ha! And the flap has been gummed, if I am not very much in error, by a person who had been chewing tobacco." Trivia submitted by Joanna Davis. 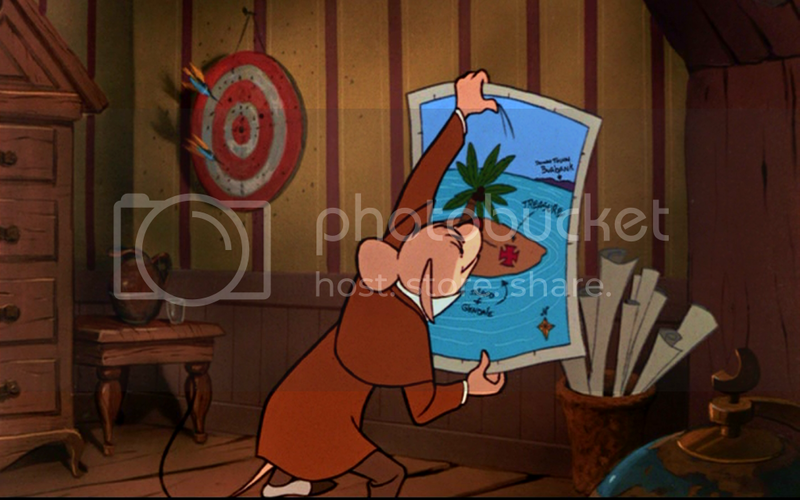 As Basil pulls out maps during the chemical testing scene, he quickly looks at one with a red X on a small island. If you pause the screen, you'll see he drew some arrows and descriptions on the map. The first arrow points to a city in the distance and is marked as Downtown Burbank. The second arrow points to the red X and is marked as Treasure, and finally the third arrow points to the small piece of land itself and is marked as Island of Glendale. The Walt Disney Animation Studios is headquartered in Burbank, California. There are some identical character movements in the film that are parallel to characters in other Disney films. For example, when Basil catches Olivia, she falls harshly into his chest and looks up to him briefly. This similar movement occurs with Ariel and Prince Eric in The Little Mermaid (1989), and with Jasmine and Aladdin in Aladdin (1992). Incidentally, all three films were directed by Ron Clements and John Musker. An additional character movement I would like to point out is during the verbal harassment Ratigan gives to Basil after he tricks him. Basil is seething with anger as his adversary playfully teases and insults his sailor disguise: "Oh, by the way, Basil, love your costume!" The way Basil stands there so stiffly is very parallel to Roger Radcliff from One Hundred and One Dalmatians (1961) as Cruella De Vil also berates him: "Why, you horrid man!" In some beautiful concept art, there are many unused scenes or ideas during the storyboard sequences. Some of these include: an older version of Olivia, Basil on top of the head of a carriage horse and telling it to go to Buckingham Palace, and Mrs. Judson exclaiming that it was Ratigan who kidnapped Olivia. An early idea was to have a stool pigeon assist Basil in receiving information, but was soon dropped when the writers felt he should figure everything out on his own. In the Eve Titus book, "Basil and the Pygmy Cats," Basil used a stool pigeon named Cyril to discover Ratigan became the ruler of Bengistan, a mouse kingdom in India. In the Doctor Who episode, Deep Breath (S08E01), there are a few references to The Great Mouse Detective. 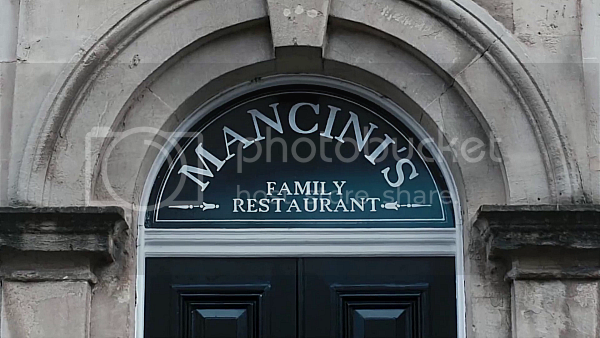 The era in history takes place in Victorian London, there is a restaurant called Mancini's, and the Doctor (Peter Capaldi) has his final showdown with the main villain, a Clockwork Robot (Peter Ferdinando), in an airship flying above Parliament's clock tower. Although the queen is based on the real life monarch, Alexandrina Victoria, the name 'Moustoria' (or spelled 'Mousetoria') is never mentioned. She is simply known as 'The Mouse Queen' in the opening credits. In the Doctor Who 50th anniversary special, The Day of the Doctor (S07E13), the 10th Doctor (David Tennant) visits Queen Elizabeth I (Joanna Page) in England 1562 where she is attacked by a Zygon, an alien that can take an identical form of the person it touches. The queen has a shocked moment of seeing herself that literally (no pun intended) mirrors Queen Moustoria as she stares in astonishment at her robot replica. Both royals even say the word "Extraordinary" at the sight of their double self. Queen Elizabeth I also says, "The creature has captured my exact likeness - this is exceptional." 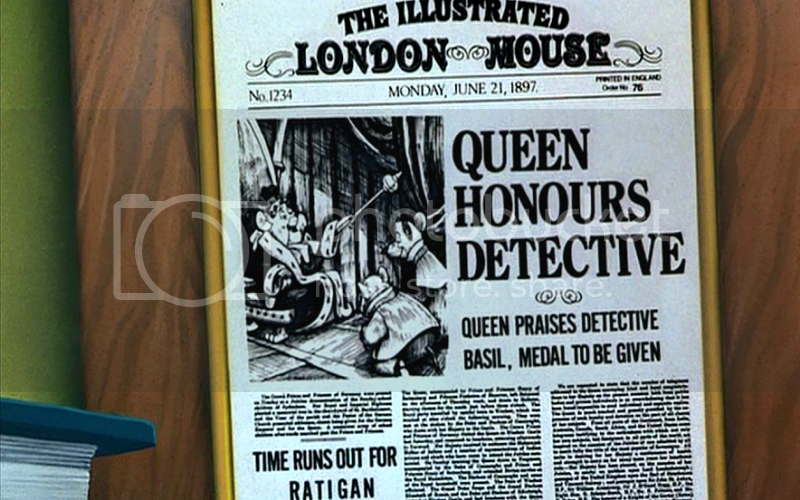 At the end of the film, the headline of The Illustrated London Mouse reads, "Queen Honours Detective," followed by "Queen praises Detective Basil, medal to be given." He was possibly given a Citizen Medal of Honour, or what is usually bestowed upon a civilian for an outstanding act of bravery against the eye of the enemy. With the newspaper date reading: Monday, June 21, 1897, one can assume this special event took place on Sunday, June 20, 1897. The official date for the Diamond Jubilee procession of Queen Victoria is June 22, 1897. To read more about the real life celebration, check out this article titled, Queen Victoria's Diamond Jubilee. One more interesting tidbit: "Time runs out for Ratigan" is naturally a witticism from the mouse reporter when the professor fell to his death from the clock tower of Parliament. Bing Crosby was considered as a role model for Basil, but when it came to the artwork, the character seemed too mellow. According to one of the animators, Rob Minkoff, Barrie Ingham was chosen, "because his interpretation of the character established his whole attitude and gave us the perfect timing and movements." 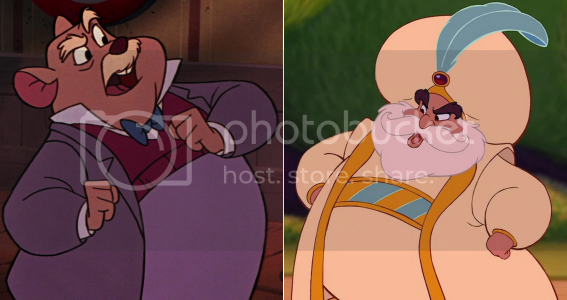 Bartholomew, the drunk mouse who insults Ratigan during "The World's Greatest Criminal Mind," was also voiced by Basil's actor, Barrie Ingham. Despite having no previous acting experience, eight year-old Susanne Pollastchek was chosen for the role of Olivia due to her sincere and naturalism in her vocal performance. There are some noticeable similarities to the interaction between Basil and Olivia Flaversham and the Doctor and Maebh Arden. In the Doctor Who episode, In the Forest of the Night (S08E10), a young girl named Maebh (Abigail Eames) runs through the woods while searching for someone called the Doctor (Peter Capaldi). He was off-putting to her in the beginning, but once he discovered she had vital information, he became much more open and understanding. Basil is very much like the Doctor in this same sense. They both come across a lost child and try to help them with their problem while a bigger problem is happening at the same time. Maebh and Olivia also meet someone who is known to be clever and quick-thinking yet a bit awkward around children. As with many recording sessions at Disney Studios, the actors performed their lines solo. Barrie Ingham himself has stated he met up with Vincent Price at the film's premiere, but has never met Olivia's voice actress, Susanne Pollatschek. In the TV series, The Rivals of Sherlock Holmes, Barrie Ingham played Dr. John Thorndyke in "The Moabite Cipher" (Season 2, Episode 9). The character's attire has a striking resemblance to that of Basil's detective attire: a brown tweed Inverness coat and a wide cravat. In the Doctor Who episode, The Zygon Inversion (S09E08), the Doctor (Peter Capaldi) asks Osgood (Ingrid Oliver) what her first name is. Instead of answering, she asks him what his name is. He tells her, "Basil." This is an interesting connection since Barrie Ingham was in Doctor Who. He played a character named Paris (opposite William Hartnell, the First Doctor) during the 1965 story arc, The Myth Makers, followed by an alien named Alydon (opposite Peter Cushing's Doctor) in the film, Dr. Who and the Daleks. An earlier scene in the same Doctor Who episode, The Zygon Inversion (S09E08), the Doctor (Peter Capaldi) and Osgood (Ingrid Oliver) have an emergency landing after their plane explodes. 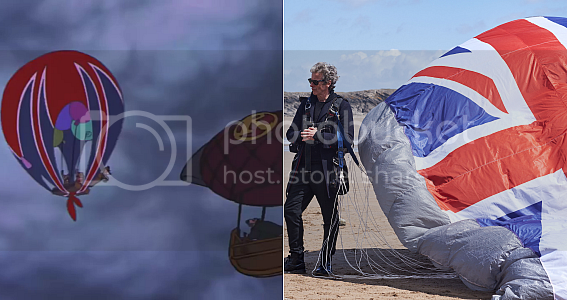 Being an alien and wanting to 'blend in' in the UK, the Doctor's parachute design is of the Union Jack flag. 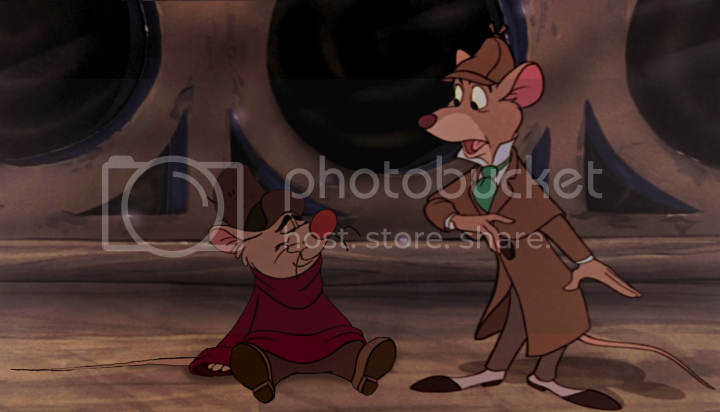 In The Great Mouse Detective, Basil used a Union Jack flag to anchor balloons and chase around Professor Ratigan in his dirigible. Before providing Dr. Watson's voice, Laurie Main played the same character in the TV series, "CBS Children's Mystery Theatre" (1980-82). 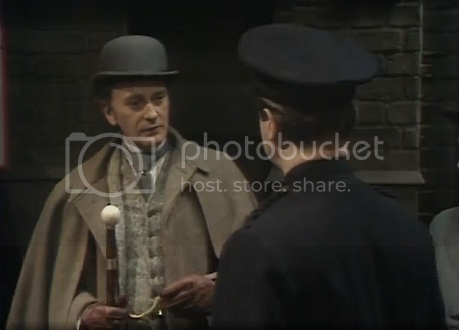 He was in the episode, "The Treasure of Alpheus T. Winterborn" opposite Keith McConnell (Sherlock Holmes). In 1985, Barrie Ingham played another detective of Scotland Yard named Inspector Roger Crimmins in the "Murder, She Wrote" episode, "Sing a Song of Murder." 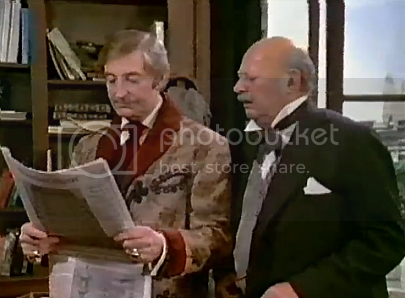 Composer Henry Mancini would later write the music score for another Sherlock Holmes spoof titled Without a Clue (1988) starring Michael Caine and Ben Kingsley. Basil appears as a bronze statuette, or the device to take Drake Mallard to his secret headquarters, in the Disney Afternoon series, "Darkwing Duck" (1990). Val Bettin (Dr. Dawson) returned to Disney as the voice of the Sultan for the Aladdin movie sequels and TV series. Incidentally, both characters shared the same animator: David Pruiksma. Due to the poor reviews of Steven Spielberg's Young Sherlock Holmes, Disney almost removed everything Sherlockian to this film. The "All New! All Fun!" movie poster is proof when Basil is wearing a normal suit instead of his traditional Inverness coat and deerstalker hat. Rumors also began of changing the British voice cast with American actors for the U.S. release. 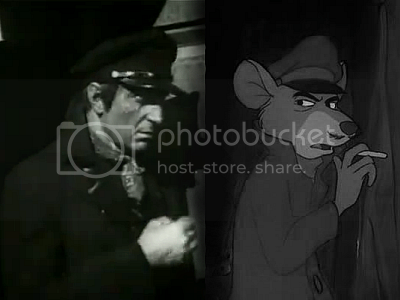 Basil's sea captain disguise in the Rat Trap scene is based on the same disguise Holmes (Basil Rathbone) wore in Sherlock Holmes and the Secret Weapon (1942). 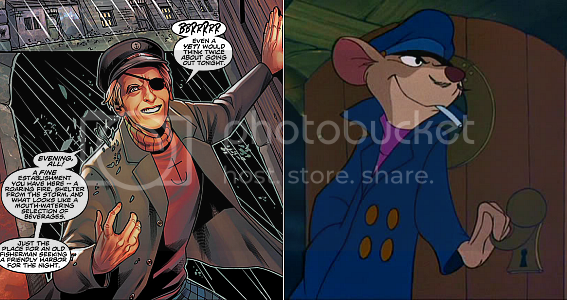 The Doctor Who comic with the Twelfth Doctor (#2.2, panel artwork by Rachael Stott) looks as though it's paying another homage to the same disguise of both Holmes (Basil Rathbone's outfit in Sherlock Holmes and the Secret Weapon) and Basil (during the Rat Trap scene). The comic issue's release date was on February 10th, Barrie Ingham's birthday. 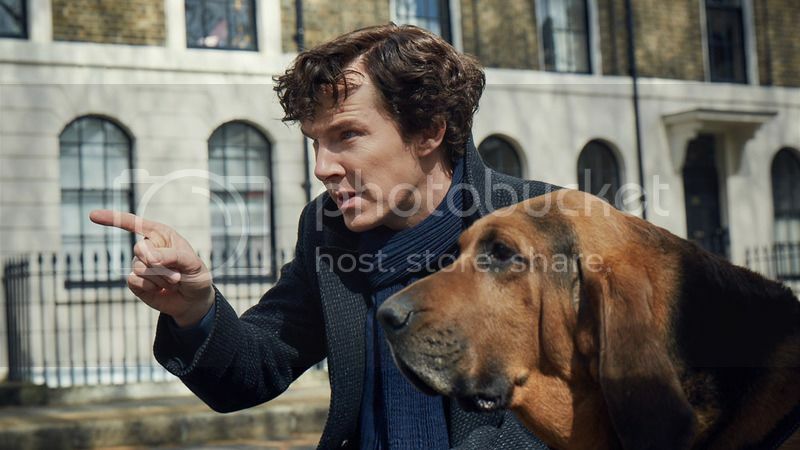 With Holmes using a dog named Toby as far back as the Sir Arthur Conan Doyle books, the hound once again helps the human detective in the BBC TV series Sherlock (Benedict Cumberbatch). He appears in The Six Thatchers (S04E01), first airing on January 1, 2017. Basil Rathbone's voice is from an excerpt of a Sherlock Holmes radio show titled "The Adventure of the Red-Headed League." 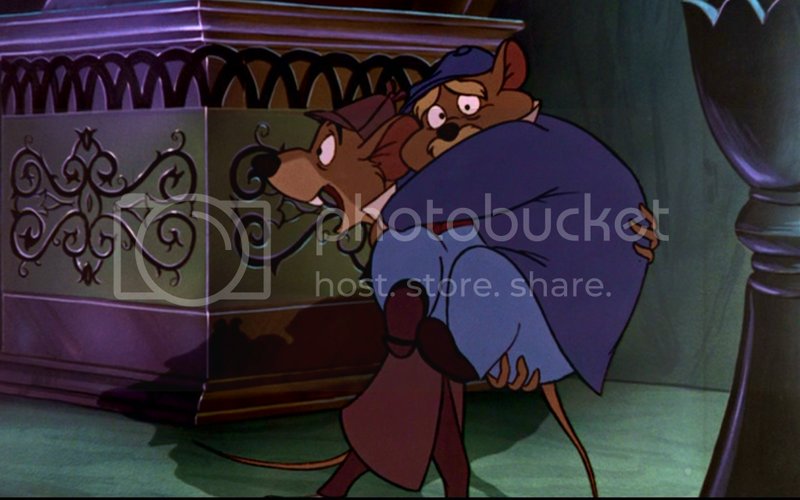 This makes the second time Rathbone's voice has appeared in a Disney film, the first being the narrator for "The Wind in the Willows" sequence of The Adventures of Ichabod and Mr. Toad (1949). Some often have said that Ratty's deerstalker is a homage to the actor portraying the legendary detective in many films. The characters tend to have things in common with their voice actors. For example, during the behind-the-scenes featurette, Val Bettin wears reading glasses to read a portion of the script while Barrie Ingham does not. In the film, Dr. Dawson also needs reading glasses while Basil can read things without them. The same applies to Vincent Price when Ratigan applies glasses to read things. 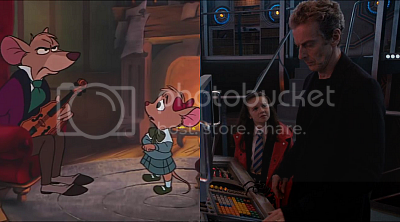 An actual name holds the real inspiration behind The Great Mouse Detective film. William D. Cottrell (1906-1995), a Disney Legend, was a long-time fan of Sherlock Holmes, and it was this Animation Imagineer that conjured up a 'dog' detective for an animated feature. When Meitantei Holmes (Sherlock Hound) already existed, they switched to a mouse world and based the story from the Eve Titus series. A tribute for Mr. Cottrell comes in the form of a window in Disneyland's Main Street and is very fitting for the Sherlockian fan. The window reads: "Detective Agency: We Never Sleep- W. Dennis Cottrell, Private Investigator." See Photo.